In late 2010 it was decided that we would take a new assignment, this time in the country of Ghana. We believe that the Lord is in that. We hope that this page helps answer your questions about this move. Ghana is in west Africa. 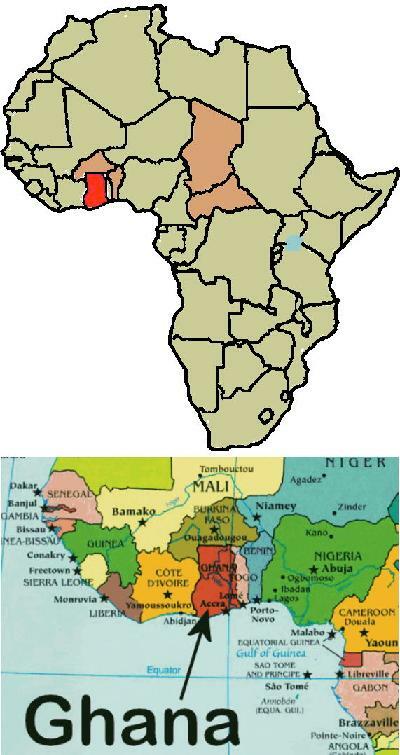 In fact, it is just south of Burkina Faso where we worked from 1978 until 1998. We will be living in the city of Accra, which is on the coast. It is a large city with a population of nearly 2 million. Our work will take us to other countries, so Accra will be more like a base of operations, than a place where we do all our work, especially for Ed. The map shows Ghana and some of the other countries where we will probably be working. Helping African organizations plan to complete all the Bible translations in their countries. If that sounds like organizational-speak, it is. It might help you to think of Ed’s role like a Wycliffe person who would go to churches and missions conferences to make people aware, garner prayer support, raise funds and recruit missionaries. But Ed will be doing that in Africa. We believe that there is potential for Africans to take on most of the remaining translations. There are highly organized churches in Africa. They are self-supporting, carry out complex ministries and even have missions activities outside the country where they started. We believe that they can be mobilized for Bible translation if they have the right information. Our goal is to make sure that they have enough information about Bible translation to know if and how to engage. Once they make that decision, then our goal is to help them acquire an extra knowledge and skills they need. In the past, most translations in Africa were done by missionaries. That era is ending fast. In the near future, most will be done by Africans. Not only will the translators be African, but their work will be organized by African churches. We want to be part of that change. Why are we making this move? That question has several answers. The most important is that we believe that God is leading us. When Ed started doing some work in Ghana in June (2010), we had no idea that it would lead to a permanent assignment. 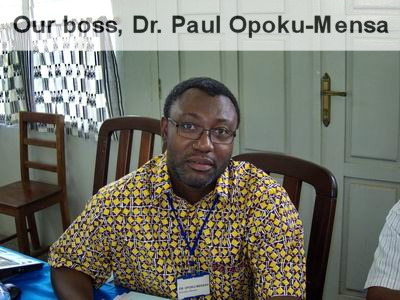 When the Ghanaian leader of GILLBT, Dr. Paul Opoku-Mensa, mentioned to Ed that he would like us to move to Ghana, it affirmed that Africans appreciate our ministry. While we were considering the offer, some of the leaders of Wycliffe International suggested that we take the assignment in Ghana, but use it as a platform to work in other countries. At the same time the Director of a national Bible translation organization in Burkina Faso, Boureïma Ouédraogo, asked if Ed could make some trips there and help with planning to complete work in all the languages there. We have always believed that our best guidance comes from those around us who see our gifts and propose what we should do. We are also confident that the things we started in Congo will continue. The translation program at the Shalom University of Bunia is well grounded in the University and will continue with or without us. We also believe that the only way all the languages of Africa will have the Bible is with the involvement of the church in Africa. But those churches do not yet have enough information. God acts on the basis of information – “How will they hear without a preacher?”. Similarly, the church in Africa will not get involved in a ministry it knows nothing about. We believe that some churches in Africa have the spiritual health and organizational capacity to carry out a complex task like Bible translation. What they lack is information and a challenge to be involved. Finally, involving the growing and enthusiastic church in Africa will make sure that what we do has lasting impact. More importantly, it will help assure that the peoples of Africa will always have God’s Word in their languages and that their churches will support that right. When Africans take on Bible translation, they will shape it to their reality, ideals and preferences. That means that when we missionaries leave, things will continue. If you have other questions, drop us an email, or use the feedback page. We would love to hear from you. Who knows, you might just ask a question someone else wanted to ask.